The Master Heat Gun is a professional quality, multi-purpose tool. It can be used for many projects including bending plastics, drying parts, heating parts, stripping paint, shrink tubing and packaging, jewelry crafting, and more. The three-way switch allows heating from 300°– 500°F (149°– 260°C). The heat gun has an adjustable non-slip base plate for stationary hold. The 3" long nozzle measures 13/16" in diameter. 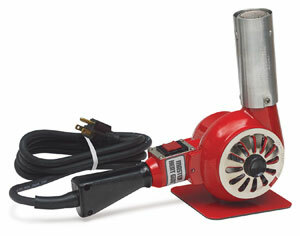 The Master Heat Gun runs on ordinary household current, 50/60 cycle, 120V, and draws 12A. It has a 3-wire cord with a 2-prong grounded plug. UL and CSA approved. ® Master is a registered trademark.